Beer, cigarettes and marijuana – the pleasurable vices of many – are all produced from plants. Hop flowers are grown in New Zealand to flavour beer, but tobacco is no longer a commercial crop. Low-narcotic hemp varieties are cultivated for fibre and oil, while the more potent variety is grown illegally. 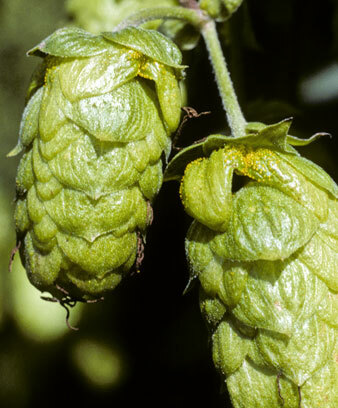 The flower of the hop plant adds flavour and bitterness to beer. Hops have been used in brewing for at least 1,000 years. Hops are grown mostly in the warm, sunny Nelson area. The vines twine up wires between tall posts. In the mid-1800s, breweries planted hop gardens. The flowers were picked in autumn, mostly by women and children. Some schools gave students a special holiday so they could help with the harvest. Hops have been picked mainly by machine since the 1960s. Today, they are made into convenient pellets before being used to flavour beer. Tobacco growing became popular around Nelson after the W. D. & H. O. Wills cigarette factory was set up in Wellington in 1919. The company helped farmers build kilns to dry the tobacco leaves. From the 1930s, laws were passed to protect growers. The government set prices, and cigarette factories had to use 30% of local tobacco. Tobacco growing expanded. By the 1970s, the tobacco industry was in decline. People were more aware that smoking was harmful to health. The government removed its legal protection, and tobacco growers changed to other crops. Hemp is the fibre of the cannabis plant, and can be made into rope, fabric and paper. The oil from the seeds is good for health. In the early 1900s, medicinal remedies were made from hemp-seed oil, and hemp was sometimes planted in orchards to help control insects. Some types of cannabis can be used as a drug, and in 1927 a law was passed to stop people growing it. However, the plants are grown illegally in many areas. In the early 2000s, people started to grow hemp as a crop, to produce fibre and oil.